I even had a go at using a stencil which is a bit of a rarity. Since I haven't used this one before, or the PTI flower and leaves, I 'm going to link up to Darnell's 5th NBUS challenge as well as Time Out's marker challenge. There's some absolutely beautiful cards made by the DT there this week so make sure you send them some love! I'm a huge fan of blue and just love how you've used it on your card! The stenciled background is done beautifully and I love those doodle flowers from PTI. They always look amazing coloured with copics and you've done an amazing job. So very glad you shared this with us at TIME OUT! You've used one of my favorite stamps AND one of my favorite colors! 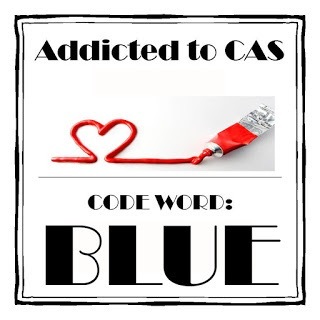 :) Stunning artsy CAS look too. Thanks for taking TIME OUT and joining our challenge! Beautiful stenciled background, and I love your bloom! Fabulous take on the challenge, Claire! 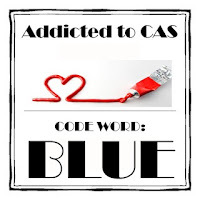 Thanks so much for playing along with us this week at Addicted to CAS! Great job on this card! I like all the blue! (this comes from a lady whose favorite color is PINK!) It makes the card look so serene and pretty! Nice stenciling! love the background you created for these pretty flowers! Beautiful card, Claire. I love the bg stenciling and need to practice A LOT to achieve such a pretty look. There you go again with those Doodlie flowers. I really must take them out and try to use them because you are making them look so good! Love this in shades of blue! I love how you have done this card. The flower is beautiful , I am waiting patiently for this stamp set. Always miss out in Australia. Ahh well you have highlighted it brilliantly and that little bit of blue background is just perfect. Very pretty! Saw this on Darnell's NBUS Challenge and just had to comment!